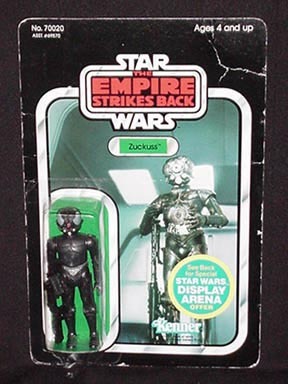 As you can see this is a Zuckuss carded sample. The figure is mounted onto a Zuckuss 45 back Arena Offer Sample Card. The figure itself is a First Shot. Most Zuckuss First Shots that have turned up have been much like this one in that the figure is a much darker gray plastic than the figure that finally made it off of the production line. What makes this sample even cooler is the controversy that surrounds it. This figure is thought to have premiered on a 48 back card yet it, much like 4-LOM, had at least made it to the proofing and sample carding stage much earlier. Production quality 45 backs have not surfaced yet for either figure but these carded samples do give many hope.